Go Green Go creates T-shirts that promote eco-friendly activities, such as walking, hiking, biking, sailing, etc. 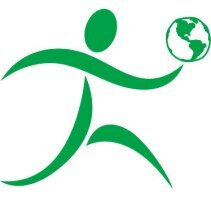 The logo is a "little green guy" carrying the earth. Their tag line is "Saving the Earth One Shirt at a Time". These T-shirts are a walking billboard--not only do they raise the awareness of the need to preserve the environment but they also promote eco-friendly activities. How did you come up with the idea for your business, and what, or who, is your main source of motivation? What is a unique feature of your business? Obviously, T-shirts are not the unique aspect of our business. The unique aspect of our business is not only how we are going to develop the business, but also who will reap the benefits of this business. We are working with students from the local community college to help to develop, design and market the company. Once the company is up and running it will be a win-win situation for all involved - not just Go Green Go. The students will have the real life experience of developing a company. The community college will be able to promote itself as having had a hand in developing a successful company. WorkcampNE will have the benefit of additional funding to help residents in many communities. And Go Green Go will be able to grow into a successful enterprise. Go Green Go is a true grassroots company, relying solely on the resources and talents of the local community to help develop and build the business. As you can see many people will benefit from the success of this company not just Go Green Go. What are your thoughts on the connection between small business and the local community? From the business model that has been presented, we know that the connection between local community and small business is essential and indispensable. We are focused on developing relationships within the community, by utilizing the talents of the young to help build a business. We will also use our energies to connect with the elderly, under resourced residents of a community to make their lives easier and more pleasant by helping them when they are unable to help themselves. It’s not just about the local communities purchasing products from small businesses, it's about showing compassion and helping others . These are things that will change lives and endure forever. Why should the Idea Cafe regulars vote for you? The regulars of Idea Cafe should vote for Go Green Go because it's a great idea. Not many companies have the potential to impact the lives of so many people. We have that potential if given the chance. The possibilities are endless - we just need a beginning. Besides the "Little Green Guy" is cute. Submitted by tinagleisner (not verified) on Sun, 06/28/2009 - 21:41. I LOVE the Go Green products! Submitted by Anonymous (not verified) on Tue, 06/30/2009 - 01:34. I LOVE the Go Green products! My kids wear the T-Shirts, I wear the hats and shirts, and they are fun, and cute for the whole family! PLUS, it's a walking reminder that we all need to be doing the right thing in this world! Sue Jenkins is a thought leader and deserves to have a chance to change the world through her humanitarian, missionary and selfless work. I hope that she gets this grant! One of the most generous and heart-warming people I've ever had the great pleasure of knowing, Sue will get things done like none other! She is just about the nicest, most giving individuals on the planet and I hope she wins! Submitted by Scott Olsen, Open Space Committee member, Fremont, NH (not verified) on Tue, 06/30/2009 - 04:54. This concept is one of the most original I've seen when it comes to eco-awareness promotion. The power is put squarely in the hands of every user through unique, personalized message marketing and positive imagery. This business model deserves this grant....hands down! Submitted by Susan Jenkins (not verified) on Tue, 06/30/2009 - 20:47. Thanks to the people who have made the encouraging posts regarding my business model. I truly appreciate the input. Submitted by Nick Andrus (not verified) on Wed, 07/01/2009 - 20:50. This is a great product line for a great reason! The materials are high quality and they feel and look wonderful. I can't wait for the 40th Anniversary of Earth Day in 2010; everyone i know will be sporting this line of apparel!